Welcome to the revival of my cookbook review blog Dewey 641. I used to review cookbooks here for about a year or so before other things became bigger priorities. Though I started out on WordPress, I later moved to a self-hosted site. So you’ll only find a couple of the earliest reviews in the archives. But let’s get to it. I love Martha Stewart’s cookbooks, to the point where I’ll overlook a lot of flaws that other cookbooks wouldn’t be able to get away with. Then again, I rarely follow recipes exactly, so perhaps those flaws are my own. Anyway, I tried out two recipes from this book. The first was Arroz con Pollo, on page 21. I had planned to try this anyway, but was pretty surprised that my teen-aged son picked this out when I handed him the book and asked him what he wanted to eat this week. What kid would choose rice with olives in it? Mine is not typical, I believe. Flaws first. 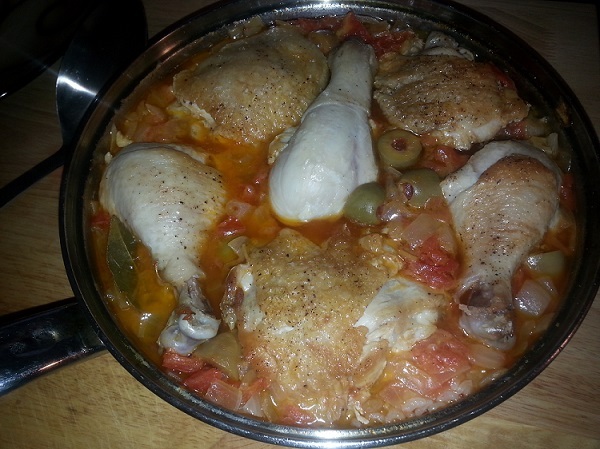 Here’s what the Arroz con Pollo looked like at the point it was supposed to be finished cooking. Looks pretty good, right? No. The rice was still kinda crunchy. I ate some. It was passable. But only OK. I’m not really sure if the cooking time was incorrect in the book or not. Because that instruction that says, “Drain all but 2 tablespoons of fat?” Yeah, I didn’t do that. (Why would I do that?) So there might have been too much liquid in the pot. But I could only see that making a difference if the fat kept the rice from absorbing water. Otherwise, the rice wouldn’t have been crunchy. There just would have been extra liquid in the pot. So maybe the timing was off in the book. Or not. Anyway, I put it back in the oven FOR OVER AN HOUR. But the extra wait was SO WORTH IT. The rice came out super creamy. And the olives lent some contrast to that creamy chicken/tomato flavor. This dish really surprised me. I happily ate it the rest of the week. Instead of typing out the recipe, I’m going to point you to it on Martha Stewart’s website, for reasons I will get to in a minute. One interesting note though. I’ve linked to the recipe as it appears in the book. But there is another very similar recipe with the same title on her site, that doubles the amount of rice, without significantly increasing the amount of stock. So, vindication, maybe. I didn’t really plan to review a second recipe, but another week went by without sitting down to post, and I just happened to make another recipe for dinner. This time I made the Chicken and Dumplings on page 17, another kid request. These were as good as any I’ve had. 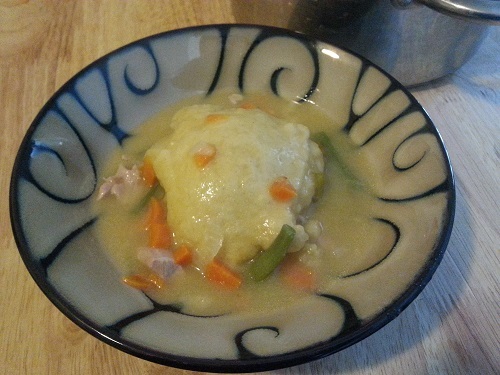 I used Bob’s Red Mill Gluten-Free All-Purpose flour for both the dumplings and for thickening the broth. I could not tell the difference. I thought the biscuits turned out a little salty, but then, I measured the salt in the palm of my hand. So, that’s on me. I’ll type this one out, along with the link, because the only recipe I could find for this version was her video. On second thought, no I won’t. Just watch the video. It’s not long. And chicken and dumplings aren’t hard to do. (Maybe I’ll come back and edit it in later. But it’s getting late.) Anyway, these were delicious. I’m probably going to buy this book. There are many, many great-looking recipes in it. But probably one of the best things about it is the fact that every recipe from it that I’ve looked for so far, I’ve been able to find on her site as well. So, then, why get the book? Browsing for recipes online is a horrible experience. I remember how excited I was when content sliders started to be introduced to webpages. Suddenly, I could flip through recipes or images without having to wait for the whole page to load (along with its gazillion flash ads, which always seem to load first) every time I wanted to move on to a new recipe. But I guess somebody figured out that if the whole page didn’t load, they were missing out on ad revenue. ‘Cause we’re back to having the whole page load every time, even though the slider’s still there. So, I use the book to browse. I pick out a few recipes I’d like to try, then I go to the website and search specifically for the recipe I’m looking for. From there, I can import the recipe directly into my meal planning/shopping list software with the button on my toolbar. Here’s one instance where online information can’t compete with the utility of printed pages. 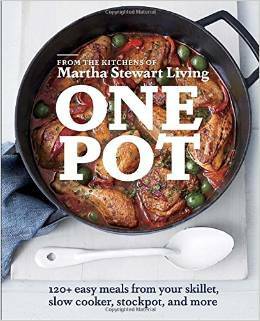 But anyway, I highly recommend One Pot from Martha Stewart Living. Check out a copy from the library, see if you like it, then buy a copy for yourself. Clarkson Potter, 2014. 21. Print. Clarkson Potter, 2014. 17. Print.